Recipe borrowed with permission from www.strongertogether.coop, where you can go to find out more about your food and where it comes from! Baked apples are one of those old-fashioned desserts that should not be forgotten. 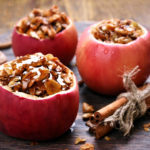 Simply core whole apples and fill the cavities with crunchy nuts and chewy fruit, then baste them with cider and maple syrup for a timeless delicious treat. Preheat the oven to 400 degrees F. Place the sliced almonds in a small sauté pan over medium heat and toss, moving constantly over the heat until lightly toasted, about 5 minutes, cool and chop. In a small bowl, mix together the brown sugar, dried fruit and nuts. Cut off the tops of the apples with a paring knife, to make a little lid like on a Jack-O-Lantern. Set the apple tops aside. Remove the cores of the apples without cutting through the bottom using a small melon baller or paring knife. If using a paring knife, cut a circle straight down. Use the tip of the knife to cut the core into pieces, angling across the cylinder to disconnect the pieces from the bottom and pull them out. Place the apples in a baking pan or casserole dish and stuff the cavities with the fruit and nut mixture. Place a piece of butter on top of the mixture. Mix the apple cider and maple syrup together, pour into the bottom of the baking pan and bake the apples, uncovered, basting every 10 minutes, until they are tender when pierced with a paring knife, 30 to 40 minutes. Carefully place the reserved apple tops on the apples at 20 minutes. When the apples are tender, transfer them to a serving platter and cover with foil to keep warm. Pour the pan juices into a small saucepan and bring to a boil over high heat. Simmer the mixture until it becomes syrupy and reduces to a sauce, about 10 minutes. Serve over the apples.